Mobogenie APK has been released and now the latest version is 2.6.10. On Android smart phone, users typically download apps through the Google Play Store as the official market. This is an application that must exist and be used on your Android phone. But Google Play Store is not the only application to download and install the application on Android. As an alternative, you can use an application called Mobogenie and 1Mobile Market. 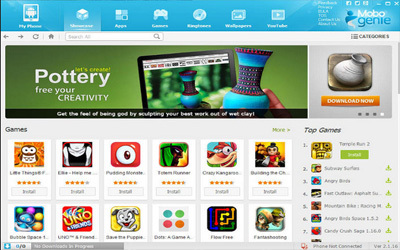 This time we will discuss about it, as the most downloaded alternative apps to Google Play Store. It has the same functionality as Google Play Store. In this app you can not only download applications only. You can download wallpapers and ringtones, it cannot be found in the Google Play Store. The design and navigation is nice and easy to understand. It has minimalist interface (UI) using white and blue colors. Various type of applications are available in each category is divided so that it looks more specific. You can find what applications are suitable to be installed on your Android more easily. In addition to providing ringtone and wallpaper for free, this application has also gone through the Kaspersky antivirus detection. In addition, it has a variety of advantages. All content within it can be downloaded for free. You can find about 1 million more free apps in it. It has a menu presentation that is simple and not complicated. You only need one click to download the entire contents. It can also be installed on a PC or laptop to facilitate users to perform backup and restore data. You just need to install USB to sync data from the laptop to the phone or vice versa. Additionally, this app is an application store that has a small size, only about 5 MB. It will not burden the RAM and ROM on your Android. But overall this is not a stand-alone application. Mobogenie for Android has not had its own server to store the entire application. So, if you will download an application, you will direct to Google PlayStore. The downloaded file was not immediately installed online, but only in the form of a master by .apk extension. This will allow you to install the application again, but some users are not convenient because it was too complicated. In all, the application is quite comfortable to use. For Android smart phone users, you can download it to find what application that suits you. Do not be afraid if your application is outdated, because all the items in it are updated regularly. Over 1,000,000 free apps& games; over 600,000 free wallpapers; over 400,000 free ringtones. All safe, all secure, virus and malware clean. 100% free! All apps, all games, all ringtones, all music, all videos, all wallpapers, always free! Support English; Portuguese; Indonesian; Vietnamese; Russian; polish; Italian; French; Korean; Thai; Spanish; Persian; Arabic; Hindi. If you got problem on old app you can install this version. It’s better than the previous app.